The 1-on-1 meetings will allow companies to meet individually with UN organizations. Furthermore, this event serves as an ex-ceptional networking opportunity with other EU companies. 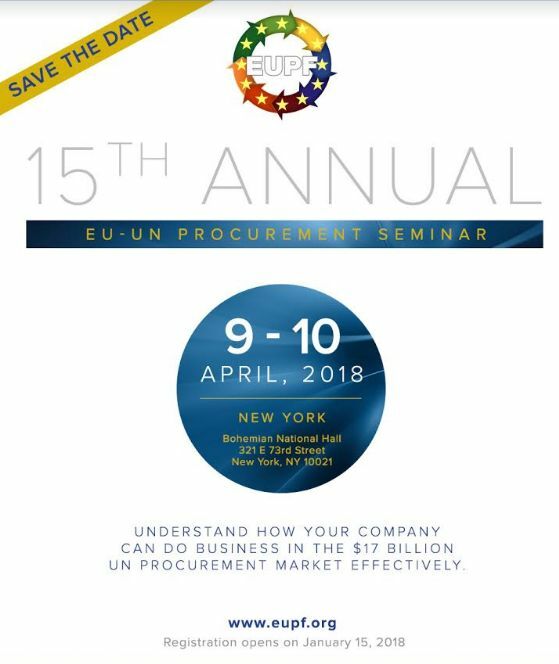 Endorsedby major UN procurement organizations & EU Missions in New York. Presentations offering unrivaledinsight of the largest UN organizations, their procurement procedures, projects and activities. Meet directlywith UN buyers, prescribers and decision makers in 1 -on -1 meetings. Invited organizations: UN/PD, UNDP, UNICEF, UNLB, UNOPS, UNDB, UNFPA, and World Bank among others.